Guitar Lessons London. At Bruce Music we provide Guitar lessons, Bass Guitar lessons, Ukulele lessons and mandolin/banjo lessons to students anywhere in Greater London. Our London Guitar lessons service also covers all the surrounding areas across South East England. Our London Guitar lessons are always highly engaging, structured and progressive. At Bruce Music: Guitar Lessons London We have a relationship-led Ethos – Based on Enjoyment, Encouragement and Motivation. Our London Guitar Teachers are expert, qualified, DBS checked, friendly professional musicians. At Bruce Music: Guitar Lessons London, we pride ourselves on only hiring the best, friendliest Guitar teachers in London. We are passionate about Guitar tuition and dedicated to offering you the highest quality Guitar Lessons London. Absolute Beginners Don’t Be Shy! We provide Guitar Lessons in London for students of any level of ability and experience, including none! Half the new students who start guitar lessons with us at Bruce Music are absolutely brand new to Guitar. Our friendly, expert London Guitar Teachers are fantastic at getting absolute beginners started and making quick progress. They’re also brilliant at helping intermediate or advanced Guitarists get out of a rut and up to the next level. Experienced and qualified, our London Guitar teachers travel to you as standard, providing Guitar Lessons anywhere in London – Travelling to your home, office, or other chosen location. Each of our London Guitar teachers covers a different are of London, meaning we can reach you wherever you are. Book your first guitar lesson in London now, below! Please use the contact form below to contact Bruce Music: Guitar Lessons London and manager Alex Bruce will respond to you as soon as possible. Our fantastic Guitar teachers are the core of Bruce Music. Enjoy this video of our guitar teachers, and read more on them below. Guitar Lessons London = £45 per hour visit. 45 minute guitar lessons (for young children) are £40. This special offer is open to all of our London Guitar, Bass, Ukulele and Piano students at any time. At Bruce Music: Guitar Lessons London we provide Guitar Lessons at your home, workplace or other chosen location, for your convenience. If you prefer, our London Guitar teachers can also host your Guitar lessons at their home, where they each have a dedicated Guitar teaching space – A suitable environment with all the necessary equipment. At Bruce Music: Guitar Lessons London, our Guitar Lessons are provided to students from ages 3+, on any day of the week, at any time of day, to suit you. Our fantastic Guitar Teachers are dedicated to working at your convenience. Our Guitar Lessons in London are for all students, of any ability level, in any musical style. So Absolute beginners don’t be shy! Around 50% of our new students are absolute beginners. Our London Guitar teachers are experts and they’ll get you playing guitar in no time! At Bruce Music: Guitar Lessons London We also offer Skype and Facetime Guitar Lessons to students worldwide via the Skype and Facetime functions and other similar programs. These Guitar lessons are fantastic for replacing missed in-person lessons in London, or for students who move away from London but want to keep their guitar teacher. The special offer of 11 guitar lessons for the price of 10 also applies to Skype and Facetime guitar lessons. Guitar Lessons London – Any Other Questions? Please have a look at our Guitar Lessons FAQ for the helpful answers to many common questions. For any other questions please feel free to get in touch to have a chat with Alex Bruce at any time. Our fantastic London Guitar teachers are the core of Bruce Music. We’re a friendly community of active professional Guitarists, teachers and musicians, all highly experienced in all musical styles with Guitar students of all ages and abilities. We hire only the best, most personable Guitar Teachers in London – Those who share our ethos and have excellent interpersonal skills. Guitar Teachers who display patience and understanding, and have a strong, clear Guitar teaching philosophy. At Bruce Music: Guitar Lessons London, our Guitar teachers are at the forefront of London’s thriving music scene, the heart of the U.K. music industry. Our London Guitar teachers are among the most in-demand teachers, session musicians and performers in London and UK-wide. Our approach to your guitar lessons is to be understanding, adaptable and to give you the best possible Guitar Lessons London, whatever your level and whatever your goals. 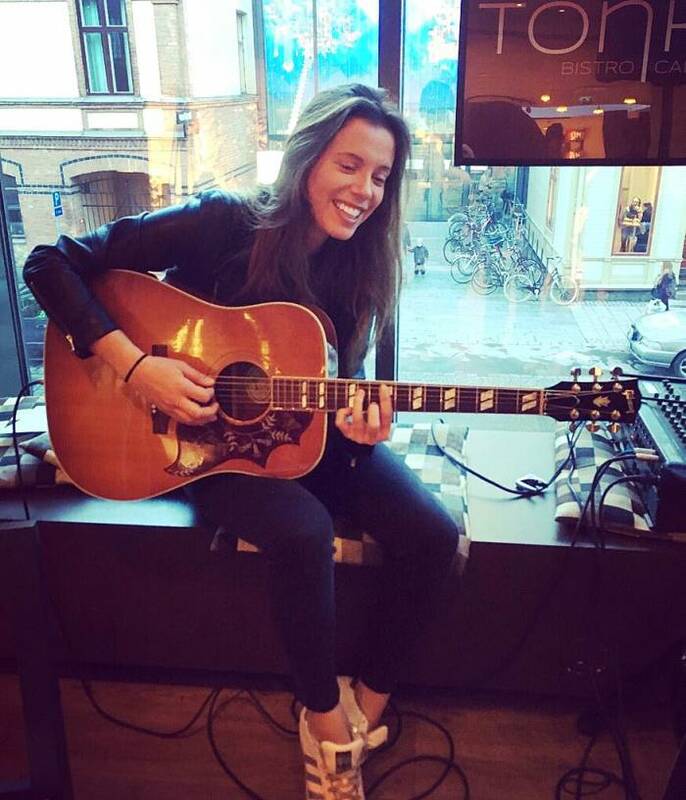 Isabel is an award-winning Portuguese Guitarist who joined Bruce Music in early 2015 while studying for her music degree at London’s renowned BIMM Institute. She is an experienced Guitar teacher who has taught students of all ages and ability levels. She is brilliant with adults and young children alike and has additionally trained and worked in the SEN (Special Educational Needs) educational sector. When she was aged just 16, Isabel achieved 3rd place in Shure’s Best Unsigned European Guitarist competition and performed on live television multiple times as a result. Now a graduate and experienced session Guitarist/live performer, Isabel has played at major Music Festivals Glastonbury, Lollapalooza, SummerSonic and Reading & Leeds with BBC Introducing artist of the year Declan McKenna. This experience has also led to sessions on BBC Live Lounge, Radio 1, Maida Vale and Vevo, as well as TV appearances on “Later With Jools Holland” and “The Late Show” in New York. My son has been learning the guitar with Alex Bruce for about 2 years. Alex makes the lessons so much fun that he looks forward to his lesson each week! Alex has such patience and enthusiasm that the children love, so they always practice without reminding. Alex has taught my son many techniques so he is very confident in performing. His lessons are current and loads of fun. I’ve been having lessons with Alex for two years now and I’m incredibly happy with how things have gone. My playing and theory has come along massively, and he’s always focused on finding my goals and working to help me achieve them. Alex has also been super encouraging – he even attended my first gig to give support! And whenever I’ve been finding something hard, he’s always found a way to re-present at the right level of challenge. I’ve really enjoyed my lessons and they’ve really grown my guitar skills. I’m planning to continue well into the future. I’d absolutely recommend Bruce Music to anyone else who’s looking to learn. I have been working with Bruce Music for about 8 months and have gone from not being able to play a chord to playing songs I love. Alex is an excellent teacher with the right balance of patience and persistence to push my playing to higher and higher levels. In addition, Alex has a great attitude towards his students and is always willing to work around changes in schedule. Absolutely would recommend to an aspiring player. Anyway, guitar lessons here are very good and thoroughly enjoyable. I had given myself a 6-month ultimatum that I’d sell my guitar/amp/processor if I don’t see tangible improvements in my playing. Happy to report that was 7 months ago and I’m making far more progress than I did in the preceding 2 years noodling about on the guitar. Importantly, Alex has a great ability to break things down. His tips on learning difficult bits in songs and on practicing more effectively are proving very valuable for me. He’s also a great guy, communicates clearly and has a great attitude for an instructor. Highly recommend. As a guitar beginner Alex found me a wonderful teacher, I have a good laugh whilst being taught with great progress. I took up the instrument late in life and wished I took it up a lot earlier but even at my age the speed of the progress has been worth while. Alex is a great teacher and very friendly. He’s really good at tailoring the classes to my needs, so I can get the most of it. Knows his craft really well and has flexible class schedules. I would definitely recommend him. Where do I start… my 5 (yes 5, now 6) year old daughter was obsessed with playing the guitar and I looked into lessons with great trepidation. Was it way too ambitious? Would it be a waste of money? Would a 5 year old really get anything out of lessons and engage? I talked to Alex at Bruce music and he said it was certainly possible and that I should give it a go. I have been truly stunned and amazed. Thanks to Luke, her incredible tutor; she not only enjoys every single minute of her lesson with him, she has learned so much too. She’s learning to read music and is now strong enough to play some cords now and some little tunes. We will continue to sign up again and again – the best extra curricular class I have ever signed her up for without a doubt. Would recommend without hesitation. I have been using the services of Bruce music for a couple of years now. The quality of teaching has far exceeded that of previous guitar teachers that I have used, and as such my guitar playing has improved significantly. I can highly recommend Bruce music as they provide a personal and professional service as a music tuition agency. I have had many lessons with Alex and it has been really great from the beginning. He is a perfect teacher and I have improved a lot despite having played for years before those lessons. He is patient and really dedicated, so when I left London, I decided to keep having sessions with him on Skype. A great teacher! An excellent guitar teacher. Made it super easy for me to learn and play the guitar, and I had no experience what so ever. Highly recommended. Very pleased with the teaching and service. I looked online for a company to teach my 15-year-old son guitar lessons. I chose this company because they were located nearby. They answered my query company immediately. They have been on time for every lesson and come to the home. We have done about 8 lessons thus far – on a weekly basis – 1 hour each. I believe that they do also provide lessons for other areas of London. My son has improved tremendously so far and is loving his lessons. The teacher – Alex – is perfectly suited to his personality and pays a lot of attention to what my son is interested in learning. I cannot recommend this company highly enough!!! I’ve been really impressed with Bruce Music. Alex’s service and correspondence is always quick and personal. Their teacher Daniel has been teaching my son for about a year. My son enjoys playing and practicing and has even started a band. It’s great to see him enjoying music. Would definitely recommend. I am an absolute beginner & was very nervous but Alex put me at ease. He is so patient & explains everything so I could understand. Very impressed would recommend him to anyone. Alex is a fantastic teacher. I’m not always the best student but he’s always amazingly patient and I learn a lot. I’ve been taking guitar lessons from Bruce Music for a few months now, and am quite excited about how it’s gone so far – from knowing nothing about how to play the guitar, I was singing and playing to my first numbers within 3-4 lessons!! Being a work professional, I love the fact that Bruce Music is flexible on scheduling lessons – which allows me to continue with them. Teaching style is completely tailored to my individual needs as opposed to a one-size-fits-all approach. Brilliant so far! Alex is a fantastic guitar teacher. I’ve been having lessons almost every week for two years and my ability has improved drastically. He teaches with a friendly, easy-going manner, with a good balance between practical skills and music theory. Have already recommended to other friends. Would definitely recommend again. I have been taught by Alex for 2-3 months now, and I have improved a lot, as his lessons are very productive and you learn a lot from it. My son has been learning Guitar for a couple of years now. He moved on from electric guitar to classical, and his new teacher helped in developing interest in Classical guitar. My son has now wanted to continue with Classical guitar after gaining a Merit in Trinity Grade 1 and I must compliment the patience and attention from the Tutor (Daniel) in this achievement. He teaches in an easy-going manner while explaining practical skills and music theory. I would highly recommend Bruce Music. Brilliant. Good communication and even better service. Always a pleasure to deal with Alex and met some great new people along the way. Highly recommended for both beginners and experienced players looking to extend their musical knowledge and skills. Thanks guys! I’ve been having lessons for about a year and it’s been brilliant. I was a self-taught Guitarist for a few years and I’ve always sung as well anyway. When I started having lessons I made a really big leap up in both those things. I’m now starting to play open mic nights around London, which has always been an ambition, so I’m really happy with that and I highly recommend Bruce Music. I’d highly recommend Bruce Music to anyone who wants to pick up music lessons. I initially emailed them asking about getting guitar lessons, and they responded the same day. I have weekly lessons with Daniel Armstrong and am thoroughly enjoying them. As a beginner it can be daunting to learn a new skill, but Daniel is a very patient and personable teacher. The lessons are very convenient as I have the teacher come to my house, and each week I feel more capable than the week before. Overall I’m incredibly happy, so thank you! Professional service from talented teachers. Recommended. Great professional service, our teacher is very accommodating to our requests and is always prompt and provides us with a fun relaxing lesson.